Balinese Chicken (Ayam Pelalah) – Balinese food is spicy and calls for numerous spices in the preparation process, but it’s well worth it! As you might have guessed, my favorite region in the whole world is Asia. And of all Asia, my favorite island is Penang, my hometown, and my second favorite is Bali, Indonesia. I love Bali—its lush green fields, Hindu temples, rolling highlands, sandy beaches, rich culture, and friendly people. I’ve been there a few times and wish to learn more about its cuisine. I’m so happy to come across Cooking Tackle, an Indonesian food blog by Ira, based in Bali. Cooking Tackle is a visual eye candy. I absolutely love the exotic recipes and mouthwatering food photography. The blog is simply delicious! Please welcome Cooking Tackle and Ira to Rasa Malaysia, with a traditional Balinese chicken, or ayam pelalah recipe. Although the sky for the most part is grey here in Bali recently, it doesn’t mean that I’m lack of motivation. In fact, cooking has always been an enjoyable experience, so you could imagine how excited I was when I received an email from Bee, inviting me to be a guest writer on Rasa Malaysia. We discussed the recipe via email and I proposed a Balinese recipe to showcase Balinese cuisine to Rasa Malaysia readers. I was very happy that both Bee and I liked the idea. To be honest, I take this guest post as the perfect opportunity to share my passion for Balinese cooking with the many readers on Rasa Malaysia, especially to those who are not familiar with Bali and its interesting cuisine. I’d like to thank Bee for the honor to be here. I feel privileged to be able to share my humble recipe here. Let me introduce myself: My name is Ira, an Indonesian woman who lives in the island of the God, the island of a thousand temples—Bali. Bali is genuinely beautiful; it’s a magical island to many people who have visited it. Bali is the island chosen by God, by its people…it’s exotic and heavenly! I’m sharing a recipe of Balinese food today. Balinese chicken or ayam pelalah is a traditional and authentic Balinese dish, an everyday dish as well as a ceremonial staple. The chicken is first grilled and then tossed with many aromatic Balinese spices. 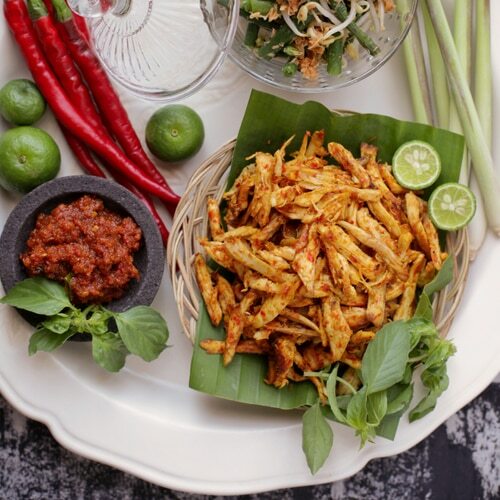 It’s one of the most scrumptious Balinese recipes and it’s iconic to Bali. Ayam pelalah is commonly served as a side dish or as a compliment for nasi campur Bali or Balinese mixed rice. The general assumption is that Balinese cooking is tedious and takes a long time to prepare. However, I believe that if you’re passionate about learning Balinese cuisine and have patience, you’ll never be hindered by this presumption. I personally think differently as cooking traditional Balinese food is like a sacred offering to the God—it’s the belief of Balinese Hinduism. However, I must warn you that Balinese food is spicy and calls for numerous spices in the preparation process, so it’s true that cooking Balinese food is a tedious process. I learned about Balinese food when I attended a Balinese cooking class last year. I also own a couple Balinese cookery books. After the cooking class, I couldn’t wait to go home and started cooking Balinese food for my family. I was so excited to be able to make authentic Balinese dishes; it was a fun and wonderful experience. I was very lucky as I learned authentic Balinese cooking from a native. Nothing beats learning from native home cooks; they are the most humble, kind, and sincere people I’ve ever known. Since then, I’ve been cooking and experimenting authentic Balinese cooking at home. Balinese Chicken (Ayam Pelalah) recipe - This chicken is an everyday dish as well as a ceremonial staple. Balinese food is spicy and calls for numerous spices in the preparation process, but it's well worth it! Back to the chicken in the oven. When it's done roasting, remove from the oven and let cool. Discard the skin and deboned, shred the meat into medium-thick strips. Take a spoonful of the spice paste, combine with the chicken meat with the spice paste, toss well until the chicken until the chicken is perfectly coated with the spice paste. Add another spoon of the spice paste if not well coated. Serve the remaining spice paste as a side or as sambal. The limau lime (jeruk limo/nasnaran Mandarin), or jeruk sambal is used for enhancing the flavor of sambal and sauces. It's commonly used in Balinese cooking. The fruit is small with a smooth skin surface, it releases an aromatic and citrucy smell when it's touched and squeezed. Bee I love Bali. Thanks for featuring this recipe and take me back to my holidays at Bali. I love sambal…the second picture practically makes my mouth waters. I can imagine the taste of this Balinese chicken. This is making my mouth water – It sounds so tasty! Wow …. delicious looking chicken… Hope to re visit Bali some day …. I’d like to have this with a plate of rice. That’s new for me, never see or eat it before. Can’t wait to try this! The combination of spice paste and aromatic herbs looks so good…since I can’t eat chicken,, I’ll try this with fish. Thank you, thank you! Never tried cooking Balinese food and this all sounds so delicious and looking forward to trying it. Hi Ira / Bee, is the shrimp paste compulsory? I bought a block of dried shrimp paste from a local Asian supermarket labelled terasi/belachan (Malaysian made). How do I toast it? And my partner hates shrimp paste smell, any tips in cooking this without overwhelming the entire house with the smell? Wrap with layers of aluminum foil and roast it for a few minutes using oven. I have made these twice now, both a success. Love it every time!!!! We have returned from Bali. we loved the place the friendly people . the food was awesome and so flavoursome I loved it in fact i loved every bit the country had to offer. I went to Bali to meet some friends who are both, like me, originally from Louisiana in the south portion of the USA.I had four days on my own and stayed at an beautiful old resort at the end of the old part of the city. It was wonderful, but I really got a work out because the Villas were all nestled into the side of a hill with huge stone steps. If I needed something to eat or drink, I went out on my balcony and rang a bell. In no time at all there would be a young man politely waiting at my door to take my order. I was walking down to the beach area to send a wire to my friends and peeked into a humble restaurant. What I saw inside was a beautifully decorated group of rooms with chocked fully gorgeous native plants. While I was deciding whether I would dine there for my midday meal, the owner came up to me. He wanted to chat. Since I was obviously American d\or a Kiwi or an Aussie he spoke English to me. Not perfect English by an means, but I could understand what he was saying, We talked about Bali for a while and then to my amazement he asked me to come to his kitchen and prepare Teriyaki Fish. He explained that many of his tourist guests and world-wide expatriates living on Bali had asked if he could prepare a Teriyaki meal. I thought, “Well why not? I am in an exotic village on the island of Bali, so this could be an exciting opportunity, and something I would naturally remember forever”! The kitchen was small but well organized so I set out to see what vegetables.fruits. condiments and sauces I might use to create a Balinese version of Teriyaki sauce. They did have fresh ginger, lemon grass, several different kinds of Ketchups, spices and the largest papaya I had seen anywhere. Everyone in the kitchen helped me. and the fish just caught an hour ago was perfectly firm and fresh; so I left it whole and slathered it with a variety of sauces, chopped fruits and the basic vegetables they suggested. It definitely was NOT the traditional Japanese or Hawaiian version of Teriyaki “anything”, but oh my lord,it was scrumptious. The owner and I ate in the dining room at the prettiest table of all, and he was so grateful for the recipe I had written out in English that he insisted on naming it” Teriyaki Fish Bebe”. I did try to tell him it was NOT Teriyaki, but soon saw that it was hopeless.He actually sent me a Christmas post card to thank me again! I met up with my friends,at last,and we continued our adventures a few days later with a trip to Lombok and The Gillies Islands. Believe me, that entire trip was an adventure that is another long story! Thanks for the recipe! Could you tell me what the green bean/sprout dish in the photo is? I had something similar in Bali several times but didn’t catch the name or a good recipe.